Get All The Aromatherapy Information about Aromatherapy, Essential Oils and Massage to Help Improve Your Health! Aromatherapy is an effective complementary therapy involving the systematic use of essential oils from aromatic plants in holistic treatments, to improve physical and emotional well-being. It is an effective healing process in which both patient and therapist play important roles. We use massage combined with essential oils to initiate that healing. These oils are often referred to as the 'life-force' of the plant. They contain many beneficial properties, which may either be relaxing or invigorating, depending on the particular oil used. They are generally strongly antiseptic and anti-bactericidal, whilst some are anti-viral and anti-inflammatory. Aromatherapy is a holistic therapy, - that is to say, - we treat the patient or client as a whole person and not just the symptoms or a particular illness, taking into account the Mind, Body and Spirit of the person seeking help. Regular treatments can bring about a dramatic improvement in general health and well-being and Aromatherapy can be used for common stress related disorders, such as - anxiety, depression headaches, and insomnia. It is also useful for aches and pains, respiratory problems, PMS and menstrual disorders. Although Aromatherapy may be quite new to you, it is as old as the pyramids of Egypt and the Egyptians practised a form of Aromatherapy some 5000 years ago. The essential oils exert a subtle influence on the mind and combined with a relaxing massage and an empathetic approach from the therapist, it offers a truly holistic, gentle and natural alternative to conventional and psychotropic drugs. 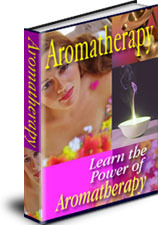 The Aromatherapy Home Health Course is a fully comprehensive study in the Gentle Healing Art of Aromatherapy. There's a full explanation of Essential Oils and how to use them to maintain optimum Health. Easy to follow instructions..
That Will Have You Relaxed, Working Smarter and Feeling Better in No Time!"